Christopher Anton Rea (/ˈriːə/ REE-ə; born 4 March 1951) is a British rock and blues singer-songwriter and guitarist. He is best known for the 1978 hit song "Fool (If You Think It's Over)" that reached No. 12 on the Billboard Hot 100. This success earned him a Grammy nomination as Best New Artist in 1979. The book Guinness Rockopedia described him as a "gravel-voiced guitar stalwart". The British Hit Singles & Albums stated that Rea was "one of the most popular UK singer-songwriters of the late 1980s. He was already a major European star by the time he finally cracked the UK Top 10 with his 18th chart entry; "The Road to Hell (Part 2)". In 2000, Rea was diagnosed with pancreatic cancer. Since his cancer diagnosis, he underwent multiple surgeries and was diagnosed with diabetes. In 2016, he suffered a stroke, which left him slurred speech and impaired movements. ↑ Strong, Martin C. (2000). The Great Rock Discography (5th ed.). Edinburgh: Mojo Books. pp. 800–801. ISBN 1-84195-017-3. ↑ "Bee Gees Head Lists For 6 Grammy Awards". Daytona Beach Morning Journal. The News-Journal Corporation. 9 January 1979. Retrieved 23 April 2010. ↑ Roberts, David (1998). Guinness Rockopedia (1st ed.). London: Guinness Publishing Ltd. pp. 354–355. ISBN 0-85112-072-5. ↑ Roberts, David (2005). British Hit Singles & Albums. London: Guinness World Records Limited. p. 60. ISBN 1-904994-00-8. 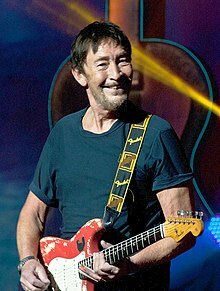 ↑ "Chris Rea operato d' urgenza: tolto il pancreas" (in Italian). Corriere della Sera: 34. 4 August 2000. http://archiviostorico.corriere.it/2000/agosto/04/Chris_Rea_operato_urgenza_tolto_co_0_0008047500.shtml. Retrieved 31 March 2014. ↑ "Chris Rea plays North East gigs". BBC News. 18 March 2010. Retrieved 31 March 2014. ↑ Gavin Martin (2 October 2009). "Chris Rea's fighting fit and raring to go". Daily Mirror. Retrieved 19 April 2014. ↑ "Chris Rea on his fight with pancreatic cancer: I'm never going to be what I used to be". Daily Express. 24 September 2017. Retrieved 10 December 2017. This page was last changed on 16 April 2018, at 04:34.